Parrotlet Breeders LuckyFeathers.com | "The best little birds in the world"
6 Month Old Parrotlet Does 11 Tricks in Under a Minute ! A short documentary about parrotlets. THE BEST LITTLE BIRDS IN THE WORLD ! Click on the photos above to see a list of my available babies. 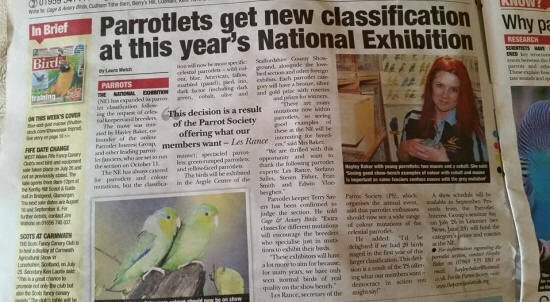 PARROTLETS MAKE THE NEWS ! Why buy a bird from my LuckyFeathers Bloodline? It’s about having the very best quality parrotlet. bred baby having the possibility of living 15 to 20 years. that you see advertised by other breeders in order to produce rare color mutations. is not affiliated with any other breeders. Hello, My name is Sean Ira, Many times you will see me use my breeder name Lucky Feathers when posting articles or working on press releases within the bird breeding world. I believe it is very important to know what kind of breeder you are buying from and what conditions are the birds being kept in. I wrote this page for this very reason. Some of the information I write here may not be important at all, however it will give the reader a good idea of who you are buying from and the breeding ethics we practice. My sister Angela and I are small hobby home breeders, I also co-own some birds with a friend of mine who breeds English Budgies. 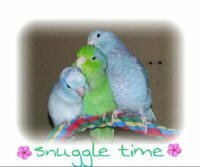 I do breed some other types of birds but I specialize in the Parrotlets. My breeding stock comes from high quality top bloodlines. 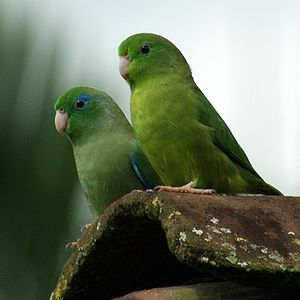 A few of my breeding pairs cost me about 1200.00 per pair or more, but that was several years ago when parrotlets were very expensive. Each of my breeders were hand picked top quality birds with strong DNA backgrounds. 90% of my aviary is set up with green or blue birds as they are thought to be stronger genetically if they are not carrying a lot of hidden mutation genes. I practice strong breeding ethics with a goal of producing top quality long life span birds. The health, size and strength of the parents can make a difference between a bird that lives 4 to 5 years compared to a bird that lives 18 to 20 years. Everything health related is passed through the DNA in the eggs on to the babies that hatch. When i started breeding Parrotlets i learned quickly that their is a strong need for the highest quality bird. So many backyard breeders are mixing these birds with related pairs and diluting the bloodline. This practice weakens the species and shortens the life span. I have selected the largest, strongest and most beautiful breeding pairs from high quality show-bird stock, and as a result with my strict breeding practices I now produce top of the line babies. We are located in Holiday Florida a part of Tampa Bay. We do not mass produce or breed birds as a sole source of income, It is a wonderful hobby that after many years finally pays for its self and it is something that I totally love doing. 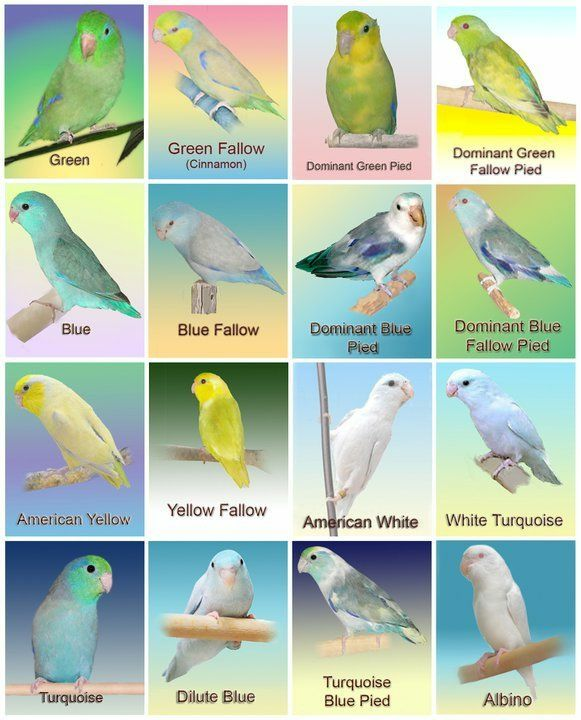 I have over 25 years of experience in raising birds and I have a lot of experience to teach and share with other parrotlet owners and breeders, as well as a lot to learn. I find myself learning something new almost every day and I am thankful to many breeder friends who have helped me over all the years. We turned our garage into a small aviary. Our adult birds are only allowed to have between 2 or 3 clutches of babies each season. Normally its 2 but I have a few breeders who just wont stop breeding and sometimes get started on a 3rd clutch before I can get them moved into the resting cages. Our hand feeding process starts when the babies are between 10 and 14 days old, I leave them with the parents just a few extra days in order to get that good bacteria and immune system built up from the parent feedings. So right about the time they open their eyes for the very first time they see me. At this time we move them right into our living room where each one is raised in heated birdie playpens and we can view them at all times, We are always playing with the baby birds because it is handy for us to do so. All of our adult breeders have toys in their cages. 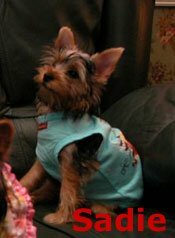 We have small children and a small yorkie dog (Sadie) that is always running around the house, the TV is always on. All of these things help socialize the new babies, From my experience a well socialized bird makes the best pet. I have been to many breeders homes and have been in hundreds of different aviaries and bird rooms, Many times I leave feeling sorry for the birds. ( no toys, no radio or TV playing ) Many breeders believe that bird toys and radio distract the birds from the breeding process, I believe it does not distract the birds from breeding and to me it is more important to have happy healthy birds that are not stressed or board. Breeding comes 2nd to quality of life for our birds. ( I have also been i many wonderful bird rooms whom I actually was inspired by over the years ) Each breeder bird is special, each one has a name and they are all spoiled with toys and healthy treats each week. As you will notice with one of our babies they are not stressed about seeing small dogs or hearing the vacuum cleaner run and they are used to the noise of small children. From the time they open their little eyes they are supplied with radio music and toys to help keep them active and social. These are some of the most precious animals on earth. As a breeder I feel responsible to make sure each and every bird has the best quality of life that I can provide. It is this very kind of person or family that we hope each of our babies end up with. A bird is a life long decision as many times the bird will outlive the owner. One thing I know for sure! 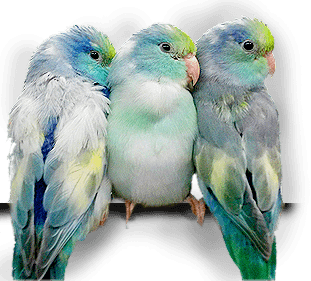 is Parrotlets. I will always try to help with any questions my customers have. As a child around the age of 12 I started breeding birds and worked in a local pet store. After about 18 years I had retired from bird breeding and moved to Florida with my son, Back in 2005 my son decided that he wanted to raise birds for himself, and because he knew that I (dad) used to do this, he asked for my help. As with any young child he lost interest early into the project and my interest re-grew, so I have taken over the aviary and run it totally as a hobby for enjoyment. Every adult breeder was hand-picked from show quality bloodlines. I am very proud of the birds, their health and our bird room. Each bird receives the very best seed mix, pellets and vitamins. Each week the birds receive fresh greens or fruits. Every bird cage has no less than two toys and different chew items to keep the them from getting bored and stressed, A simple empty paper towel roll can provide hours of chewing and play time for the birds. The Radio is set to come on each day and plays for about 14 hours. This provides the birds with a wide range of different music and noise each and every day. It also teaches some of the birds to talk and whistle a tune. It is important to me that our customers know we are not a large factory style breeder. Every adult bird has a name and we practice personalization ethics in breeding. Many customers who come to pick up the babies tell us that our website gives the impression that we are a large mass producing breeder, I don’t have anything against the large breeders except that many of them seem to have lost the personalization aspect of the hobby and have become more focused on the money aspect. My goal is to keep the personalization aspect and to take a photo of each baby and put it on the website when it is ready to sell. The photo process does make us look larger than other breeders simply because most breeders do not do this, Most breeders simply take one photo and use the same photo for all birds of the same color. I believe that each little baby is special. Each one has its own personality and they all deserve to be placed with the very best homes. As a breeder I can not always pick and choose who buys my babies, but I do feel responsible for finding each one of them the very best home possible. A bird can be a life long commitment and in many cases the bird will outlive its owner. Birds become bonded with their human owners and can become easily heart broken ill or stressed if separated. Please consider the quality of life that you will be providing your new bird prior to buying it and no matter who you purchase your bird from – make sure they practice responsible breeding ethics. Responsible breeders who practice good ethics will always put the bird and the quality of its life before the money. Thank you for your time in reading this and, please contact me directly if you have any questions, even if you are not buying one of our birds I would be happy to help you make the right purchase from anyone by answering any questions that I am able to help with. 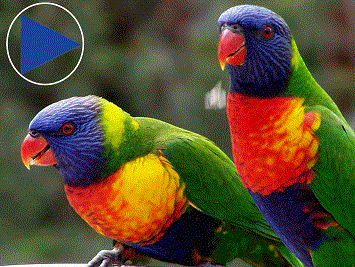 2005 to Present – Expanded into breeding Amazons, African Greys and Parrotlets. Back in the early 1980’s when I first started breeding birds my goal was to become an expert, I was very young and had no real experience. I believed that the answers to all my questions were printed someplace in a book. How wrong I was. Over the years I have read many books, university studies and watched many videos. But I have to say the most beneficial education was actually learning as I go. The best lesson I learned was to never be blinded by new ideas or new ways of doing things. Breeding birds is actually a science and what you learn as you go – will be the most important information. One way to learn valuable information is to talk with other breeders. Go to the bird shows, meet other breeders, join facebook groups and pick up some good books from the local library. Do not close your eyes to new ideas. What do my birds eat? See the diet section on my information page. All of my birds get a mix of seed, pellets and fresh veggies. Also I include calcium and vitamins in the drinking water of all breeding pairs. The health and condition of the parents directly effects the health and DNA of the baby growing in the egg and can make the difference between a bird that lives 4 years compared to 20 years. I Practice Abundance Weaning 100% of the Time. Definition: The phrase “abundance weaning” describes the way that most reputable bird breeders wean the baby birds that they hand feed. In abundance weaning, the breeders continue to give the chicks handfeedings while offering them solid foods to try, such as millet and softened pellets. The birds are allowed to stay on handfeedings until they themselves decide that they are ready to eat solid foods and drink water on their own. Most breeders agree that abundance weaning techniques lead to birds with more stable physical and psychological health. Because of this some babies actually end up taking formula upto 8 or maybe even 9 weeks old. However most babies wean around 7 weeks of age. Abundance Weaning is the most healthy way to wean your baby bird. We have a smoke free environment, and we are a ‘closed’ aviary, in that the breeding area is not open to the public in order to control disease and the stress of having strangers walking into and around the birds. 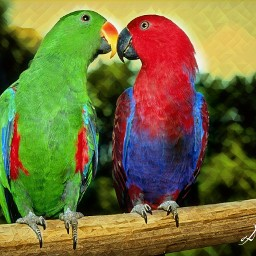 Parrots have been known to abandon the nest box and babies because of strangers being to close. This is something our African Grey has done in the past . Closed aviary also indicates that we have established all of the breeders and raise new breeders from our own stock. We do not bring birds from outside of our aviary into or around our bird room. 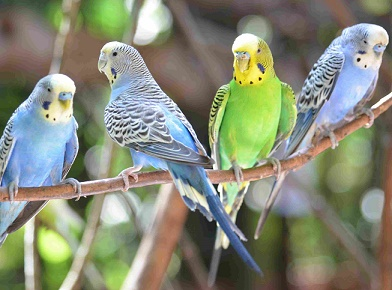 A closed aviary prevents outside illness and disease. . However, the nursery babies are open to visitors with appointments. Our aviary is custom designed to emulate a sunny bright environment that Parrotlets would have if they lived in the wild. We provide a clean-safe environment for our Parrotlets. OUR AVIARY IS CLOSED TO THE GENERAL PUBLIC. NO TOURS. This ensures a disease free environment. We are non-smokers and prefer a non-smoking environment for our birds! We use only environmentally safe cleaner in the aviary to eliminate health risks for our birds and us! Many aviaries are breeding genetic train wrecked mutations, It is extremely important now more than ever to know your breeder! it can make the difference between a little bird living 5 to 6 years compared to a genetically healthy bred baby living 15 to 20 years. From time to time I will offer babies on my website that were raised by other selected local private breeders. They are normally very close friends of mine who also practice great breeding ethics. My LuckyFeathers Bloodline is very important to me and in almost every case any birds that I may broker on my site are directly from my personal LuckyFeathers Bloodline of birds. 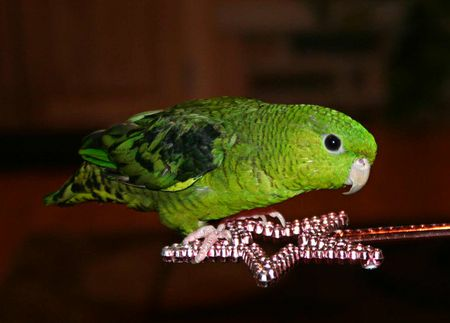 I co-own a few breeder pairs with friends and help out my cousin Billy who is also a parrotlet breeder who has my LuckyFeathers bloodline of birds. I am very selective of who I deal with and only offer brokered babies from people I know and trust completely. Any brokered bird that I offer are actually handfed and raised by myself as it is one of my requirements. For example I sold a pair of my breeder birds to Billy — Billy sets them up and they produce babies. The babies reach 10 to 12 days old and he brings them to my house. From that point on, I personally handfeed and raise the babies per my standards of quality and health. It is important to have different bloodlines available to customers who may want to breed in the future and in order to do this I have a list of quality breeders that I use from time to time. It is very rare that I have any babies available from other breeders. Maybe once or twice a year I will have some available. If they are purchased from my website they come with the same quality and health guarantee that I offer on my private bred babies. All of my babies are raised in heated play pens. My system allows each bird to be socialized and played with daily. The below play pen is an example of what the babies are moved into after they graduate from the nursery play pens. I recommend each new baby be kept in a play pen for the first 5 to 8 months. 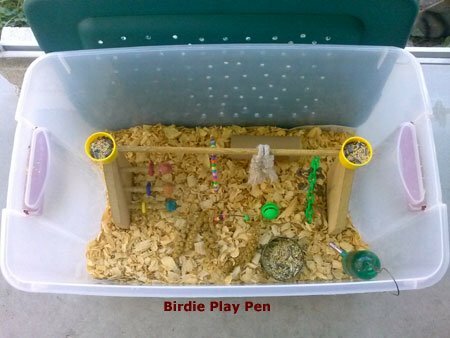 For more information about the birdie play pens click here.